The first shipment of the new Quangsheng Low Angle Jack Planes arrived this afternoon. I'm still unpacking the pallets but curiosity got the better of me so I stopped to have a play. Like all blokes the first thing I did was have a beaker under the bonnet - or in this case brushed stainless steel lever cap. 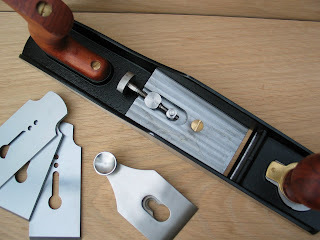 The lever cap has a countersunk keyhole so you can wind off anything up to three full rotations on the top knob, turn the whole plane upside down and shake it without any of the gubbins falling out - nice touch guys! Lifting the cutting iron out we see the double threaded Norris type adjuster, This has a coarse thread running through the big dowel pin that seats into the casting and a finer thread through the small dowel that engages the cutting iron. The overall effect one minus the other, so you get roughly a 2:1 mechanical advantage and a fine, silky smooth adjustment. The one thing I'm not overly keen on about the Norris is that it combines lateral and projection adjustment in one, but as Norris adjusters go this is certainly a well engineered example. 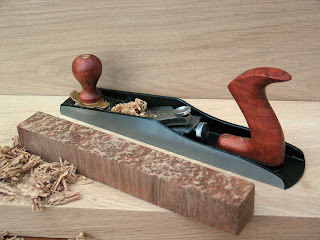 Enough engineering, let's plane some wood!!! 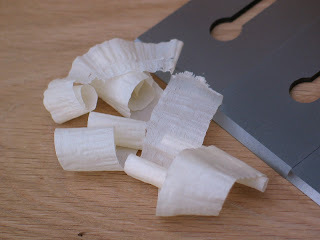 First up, a small piece of rippled sycamore yielded gossamer shavings with the 25 degree iron. I tried cutting with the left and right sides of the iron as well as the centre and couldn't make the blade shift position at all. Time for something a little more exotic - this is a piece of Corrugatta or Rib Fruited Mallee, (RFM for short mate!) that I hit up with the 50 degree iron. If I had sharpened it first I dare say I could probably have got more continuous shavings, but in a sudden fit of pandering to the 'yebbut how does it work 'out of the box?' crowd' I was still able to take the top of this piece from bandsawn to this, with only the factory ground edge on the iron. Since versatility is the whole point of low angle jack planes we are bundling a free 38 and 50 degree iron in with each plane as well as the standard 25 degree one that comes with it. After all, a Swiss army knife with only one blade is just another penknife! Overall impression: This one's mine! Yours is here. If you want a closer look at any of the pictures go ahead and give them a click (click a second time to zoom right in). 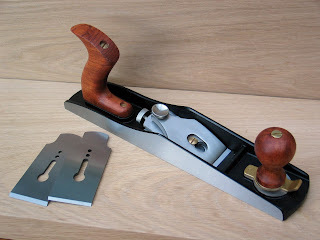 one of the biggest problems of this type of planes, as Stanley premium planes produced in Mexico have taught us, is in the perfect parallelism between the two adjacent planes of the sole and of the seat. Do you mean the adjustable toepiece and the rest of the sole? If so then these appear to have been fitted, pre-tesioned and then ground as one. It is possible to get a step if the toepiece isn't seated correctly or has debris underneath it, but in normal use a gentle jiggle of the adjuster and a little finger pressure on the centre of the toepiece as you tighten the front knob will ensure everything stays nicely coplanar. If I have misunderstood your question please let me know. I'm sorry for the misunderstanding, I try to explain me better. One of the major criticisms that first new Stanley low angle premiun planes received was that the bed (the flat area where the blade rests) was skewed (crooked, not parallel) among to the sole. The defect was later resolved after many complaints from customers and magazine reviewers. Could you, please, verify that these Quangsheng planes do not suffer the same problem? Yes, everything is as it should be on the one that I'm using. With the iron retracted the adjustable mouth closes to an almost lightproof parallel slit and both front and back eges of the mouth agree with an engineers square.